One Sunday morning, Mr. J and I found ourselves at home. This is not normal for us since our Sunday mornings are usually spent in church. Nope, we didn’t skip; we just went a day earlier. We were invited to a Saturday night service to one of Mr. J’s friend’s church (that’s a mouthful). We went and boy, was I thankful that we did because their guest speaker was awesome and spoke about a challenging and thought-provoking message on missions. Anyway, before I digress here way too much, since Mr. J and I were home, I thought that it would be a good time for us to visit a local Farmer’s market which I heared, takes place every Sunday from morning until noontime. We’ve never been able to go because by the time we’re done with church, the market would already be over, or just about to be over. So off we go. I was so excited as I’ve never been to a Farmer’s market here in Miami and this would be a first for me… Farmer’s market, here we come! Unknowingly, I was in for a great disappointment. When we got there, nobody was around – well at least the place where the market should be was empty. Where is everybody??? Well, to make a long story short, I learned that the market ended the week before. Apparently, the Farmer’s market here only takes place during spring, from February to April, mid-April to be exact. The heat this year came a little to early so they decided to end the market earlier as it was getting to be too much for the farmers here in South Florida. My oh my… so much for the Farmer’s market. Here’s a dish that is remembrance of that fateful Sunday. The sausage you see is something that I got from Wild Oats that day. It is a roasted-pepper with apple organic chicken sausage. Hmmn… even the sound of that already tastes good, doesn’t it? 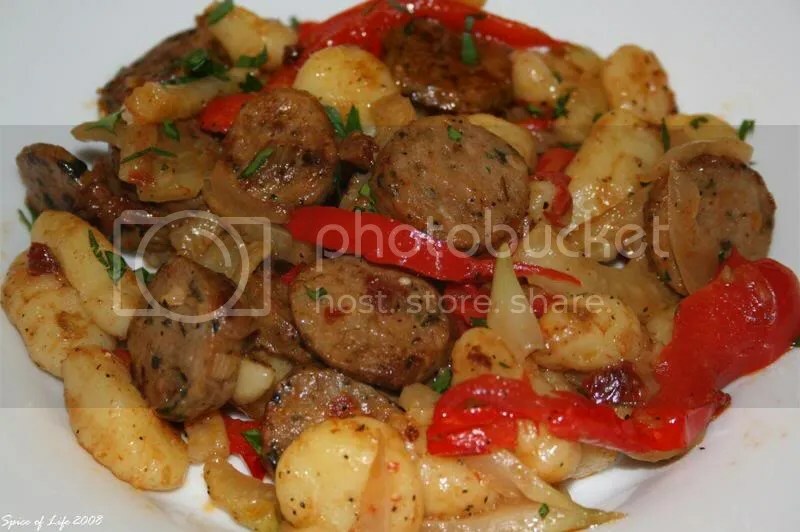 And you bet, it is… The sausage is a little spicy and sweet, hmmn.. perfect for the gnocchi and fennel. To be honest, I wasn’t sure if I should add the red bell pepper since the sausage already has roasted-pepper in it. But I added it in the last minute anyway because fresh pepper would add a different taste to the roasted one. And of course, the red color just made this dish that much more attractive to the eye, don’t you think? As for the sausage, you can always change it up according to your preference. It’s up to you, the sky’s the limit. 1. Cook the gnocchi according to package directions. Omit salt and fat. Drain the gnocchi but reserve 1/4 cup cooking liquid. Keep gnocchi warm. 2. Heat 1 teaspoon olive oil in large nonstick skillet over medium-high heat. Add sausage to pan; sauté 3 minutes or until lightly browned, stirring frequently. 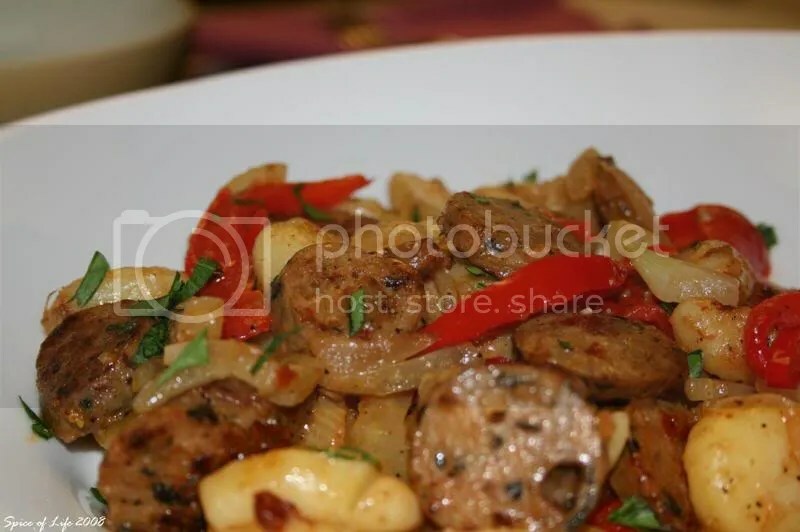 Remove sausage from skillet using a slotted spoon. 3. Heat remaining 1 teaspoon oil in pan. Add fennel, bell pepper, and onion to pan; cook 13 minutes or until tender, stirring occasionally. Add sausage, gnocchi, cheese, black pepper, and reserved cooking liquid to pan; cook 1 minute or until cheese melts, stirring constantly. Remove from heat; stir in butter. Mix till butter is well incorporated. Add parsley for garnish. *NOTE: As I mentioned above, you can always change up the sausage. Original recipe suggested basil and pine nut chicken sausage. For the cheese, you can also use Asiago cheese or Parmesan if you like. As to the butter, you can omit it. I just added a tad bit to mine for a richer flavor. I’m glad you saved your Sunday. This dish looks great! 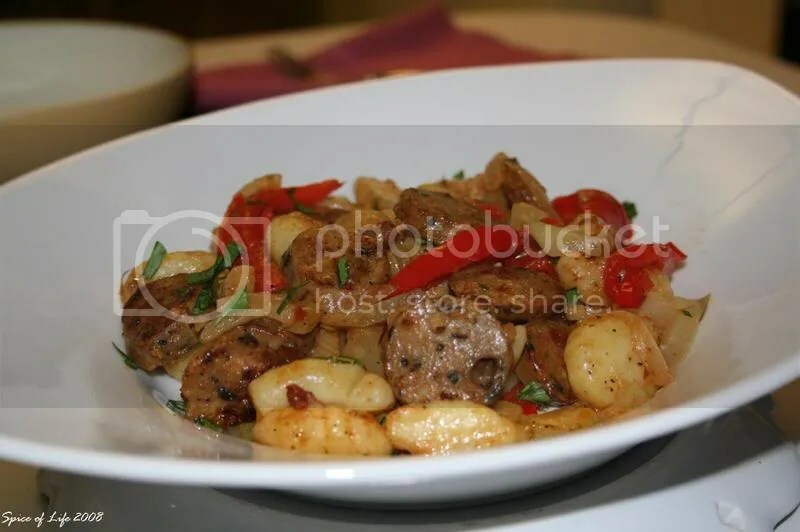 Gnocchi is one of my favorites!